This trip begins in evening from a hotel near the sand dunes in Merzouga. The camels will be packed with foods, blankets and everything else which we will need for 2 nights stay in desert. 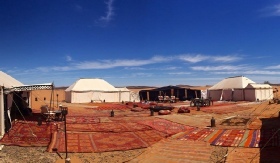 We ride camels into the desert for 90 min and we will spend the night in an equipped desert camp with Berber drum music in the middle of the Sahara. When we arrive at the camp we walk to the high dune to see the sunset. During the first night, we will have dinner around a campfire,we will spend the night in nomad tents. The next day in the morning after the breakfast we will ride the camels to visit and lunch with Nomad people. Then we will ride the camels backing to the camp, when we reach the camp, we leave the camels and we will take the sand broads and we walk to the high dunes. We will visit also nearby oasis and then we walk back to the camp after the sunset. The next day in morning we will ride the camel backing to Merzouga (after watching sunrise) and we'll have the breakfast and shower in the hotel in Merzouga.